The Dustless Blasting method uses water to suppress dust while sandblasting. Dustless Blasting can be done using either a Vapor Blaster OR a Dry Blast Pot with a special wet-head nozzle. Vapor Blasters combine water and abrasive into the pressure vessel all at once. Non-Slurry Blasters (Dry Blast Pots) combine the water and abrasive at the end of the blast hose using a special wet-head nozzle. Dustless Blasting requires water to work – the water eliminates the dust, allowing you to not bother people and vehicles passing by your project, etc. Traditional Slurry Systems also require a media that “sinks” in order for it to flow properly. All “sinking” medias are hard abrasives, which means if you have any projects which require the use of a soft media you will need to use another type of equipment. Many projects cannot be done while using water (most interior work, fire and mold jobs, certain metal prep, delicate parts cleaning, blast room work, etc.). Our Eco-Flex® equipment can run ANY type of media through it, including baking soda, a very unique and popular soft media that can tackle many different types of depainting and delicate parts cleaning operations. Using water also means you can only blast when it’s warm, or at least above freezing! No slurry blaster can effectively run baking soda through it – baking soda is water soluble and much finer and lighter than traditional medias, which makes it the one media slurry blasters cannot handle well. 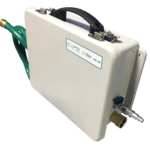 However, you can perform dustless soda blasting with our Eco-Flex® blasters – just hook a standard garden hose to our machine OR use our H2O TO GO system. The amount of water used is adjustable, and the level of dust suppression is superior. Won’t I need an Air Dryer? Yes. Since everything remains dry inside the Eco-Flex pot an air dryer is necessary. If you already own one, it will most likely work with our Eco-Flex® systems. If you don’t own one, we offer ESCA-Aire Systems. We are authorized stocking distributors for Hold Tight 102, which works great at inhibiting rust during any type of wet blasting. If you are slurry blasting, we recommend adding Hold Tight directly into the water and abrasive mixture, and then also doing a post-blast rinse down with Hold Tight. Hold Tight is a proven non-hazardous product – click here for additional Hold Tight 102 information or contact us to buy some now. Each type of Dustless Blaster has advantages and disadvantages. ESCA offers both types of equipment, including portable packages and all-in-one tow behind systems. Contact us for options and pricing. The mist created during any type of Dustless Blasting operation is similar to what you see when pressure washing, however, some spent abrasive or fine particulate can still be found in this mist formation – it is unavoidable. How far the spent abrasive travels before it falls out of the mist cloud depends on several variables, but mostly it is a function of the pressure you are blasting at and the type of abrasive you are using. The lower the pressure, the less your abrasive breaks up into fine dust particulate – larger “non-dusty” particle sizes are heavier and will, therefore, drop to the ground quicker. The type of blast media you use also makes a difference – harder and denser blast media drops to the ground quicker than finer and softer media. For instance, Crushed Glass and Jet-Mag will not travel far before falling out, but calcium carbonate and baking soda will go further because they are lighter and softer than traditional sandblast media. Crushed glass works well for wet blasting, but it still travels in the mist cloud – it is just not as noticeable because of its translucent appearance. No matter what, using water while blasting greatly reduces your dust factor, and in many cases will be the only “containment” you need. For those who already own traditional blast pots and want to perform occasional Dustless Blasting without making a large investment, we offer a special Dustless Blasting upgrade kit called H2O TO GO. This self contained system is universal and will work with any existing sand blasting operation. Click here for more information on H2O TO GO.